Your Comprehensive Guide to Athletic Mouthguards - Adelberg Montalvan Pediatric Dental PC & Orthodontics too! You know what they say, “kids will be kids.” And with kids so full of energy, it’s no surprise they experience frequent bumps and bruises — especially when involved in athletics. Chances are, at one point or another, you’ve had to comfort your little one over a bruised knee or scraped elbow. As such, you’ll invest in some extra protection, like elbow and knee pads, to keep them safe. But there’s one piece of equipment that often gets overlooked, despite its importance. That’s right, you’ve guessed it — a mouthguard! Did you know, mouthguards can prevent more than 200,000 oral injuries a year? Yet despite this statistic, mouthguards are often seen as an optional piece of a uniform! Everyone! Mouthguards aren’t just for professional boxers, they’re critical for all organized and unorganized sports, both at recreational and competitive levels. No matter your child’s age, gender, or skill level, there is a risk of sustaining a dental injury. While contact sports — like boxing, football, and lacrosse — seem most obvious, dental injuries are also prevalent in non-contact activities, like skating and gymnastics. Are There Different Types of Athletic Mouthguards? Stock guards — These are available for purchase in sporting goods stores as is. A low-cost option, stock guards offer the least protection since there is no fit adjustment. Mouth-formed guards — One of the more popular solutions, these guards can be submerged in boiling water and formed to the mouth with biting pressure. Certainly more unique to the athlete’s mouth than the stock guard, it’s important to note that typically these often do not cover ALL of the back teeth. Custom-made guards — Provided by your dentist (like AMPD!). These guards are made from exact molds of your child’s own teeth and created from resilient and tear resistant materials ensuring the best fit. Each of the above guards varies in comfort and price but do all provide some degree of protection. And while any mouthguard is better than no mouthguard, we encourage you to choose the custom-fit solution. Why? They’re the most comfortable, as they’re fit uniquely to your athlete’s mouth. And being custom-made, you’ll find it does not restrict speech or breathing — which is so important! “Everything that a microorganism needs to survive, including food and water, can be found in a mouthguard. While mouthguards appear solid, they are very porous, like a sponge, and with use, microorganisms invade these porosities.” — Thomas Glass, DDS, PhD, lead author of a study from the Academy of General Dentistry. That being said, keeping your mouthguard clean is of utmost importance. Before and after each use, clean the guard using a toothbrush and toothpaste — you can also opt for washing with soapy water, rinsing thoroughly. In terms of storage and transportation, keep the mouthguard in a well ventilated, sturdy container (making sure not to leave it in the sun). Finally, examine the guard daily for wear and tear and replace immediately if it becomes loose or damaged. We’re pleased to offer the Adelberg Montalvan Pediatric Dental Mouthguard Center in each of our three locations! And you don’t have to be one of our regular patients to take advantage of this service! 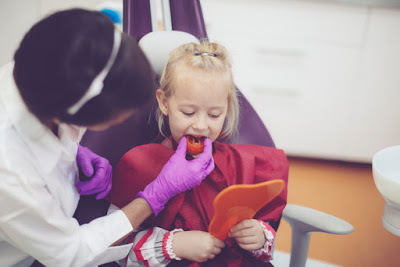 Contact us today to make an appointment; we’ll take an impression of your child’s teeth and create a guard with the highest level of comfort and protection. We can even use colors to coincide with their school, intramural, or PAL league’s uniform.